The Public Theater made a splashy statement with its summer 2017 edition of Shakespeare in the Park depicting Julius Caesar as Donald Trump. That allegory is bipartisan, though. A 2012 production in Minneapolis molded Caesar into then-President Obama. I can only speak to the experience of seeing the former production of “Julius Caesar”, but no matter how titillating or attractive the idea might be, neat analogies between ancient Rome and present-day Washington, D.C. are doomed to fail given the specifics of the plot and motivations of its characters who lean on a specific sense of pride and honor that does not exist in the same extreme flavor today. Drawing too obvious a connection between this 420 year old play and current politics is a folly, and beside the point; Shakespeare’s text is capable of making the connections on its own, as are audiences, and the story is more illuminating when played universally, instead of being stuck modeling a particular politician in a particular time. Taking the original title of “The Tragedy of Julius Caesar”, a new nondescript production by director Shana Cooper currently playing at Theatre for a New Audience (TFANA) in Brooklyn plays the story straight with a modern feel, but without an allegory. The result is both deeply engaging and flat-out thrilling. Skipping the presence of modern political avatars, the focus here is on the boiling interpersonal relationships and machinations afoot. 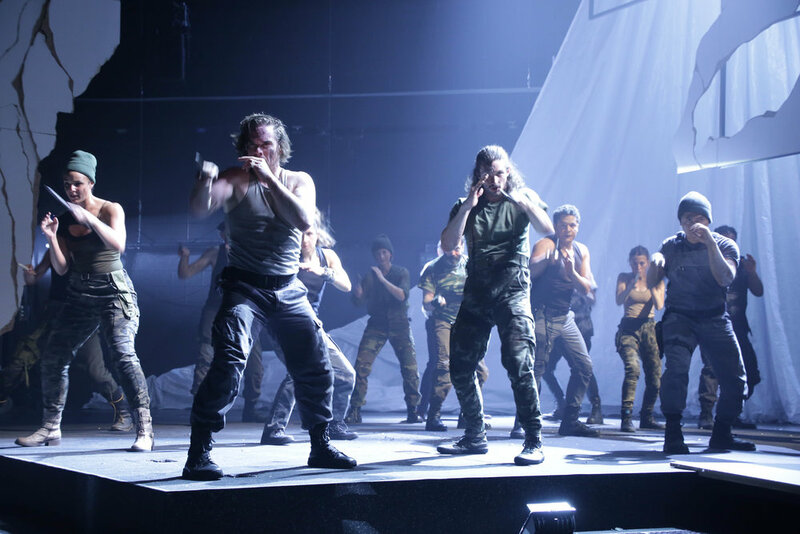 The notable novelty of this staging is its athletic use of choreographed movement (by Erika Chong Shuch) to summon the emotional charge fomented mostly through off-stage battle and crowd scenes in Shakespeare’s text. There’s also a hard-to-miss infusion of homoeroticism among the conspirators. By bringing the sheer physicality of battle and crowd scenes out of the wings and centerstage, the intensity of the political drama is elevated and sustained to powerful effect. The tempo of “Julius Caesar” post-assassination can be a drag; not so here. By the end of the play, the ensemble is run ragged, and out of breath. Likewise, that assassination scene and the brutal mob murder of the poet Cinna are viscerally portrayed, and appropriately disturbing. Brandon J. Dirden as Brutus and Rocco Sisto as Julius Caesar. Photo Credit: Henry Grossman. As Brutus, Brandon J. Dirten speaks with a preacher’s patois, accompanied by the hotheaded Cassius, given a menacing take by Matthew Amendt. Rocco Sisto’s Caesar oozes an imperial air, and the balance of the ensemble is strong, particularly Merritt Janson as the Soothsayer. While there is a lack of specificity in design—the set by Sybil Wickersheimer looks like an abandoned construction site and involves a puzzling and prodigious use of buckets—this production succeeds in capturing the spirit of the play’s action, laying bare the misguided barbarism of its characters, and lessons of politics and violence that have echoed for centuries. It is under-appreciated just how hard it is to get “Julius Caesar” right on stage; TFANA’s production comes as close as I’ve ever seen to pulling it off. Well-acted and thrillingly staged, this “Caesar” is unclouded by tricks and focused on the story—well worth a visit for any theatregoer looking to brush up on their Shakespeare. Bottom Line: Theatre for a New Audience in Brooklyn presents a new nondescript production of Shakespeare’s “The Tragedy of Julius Caesar” featuring an athletic use of choreographed movement to summon the emotional charge created by crowd and battle scenes, elevating and sustaining the intensity of the political drama. “Julius Caesar” is hard to get right; TFANA pulls it off with this well-acted, smartly staged, deeply engaging, and flat-out thrilling production.